Seamless Gutters, Seamless Steel Siding, Windows, Soffit, Fascia and Log Siding - Karst Builders, Inc.
Seamless Gutters are one of the most important parts of your home, they are also one of the most over looked. Seamless Gutters are the solution to many problems that may happen to your home. Water can do a lot of damage if it is not properly directed away from the home. Karst Builders puts seamless gutters on all of its new construction homes. Seamless gutters are not only for new construction home, they can also replace old gutters. Karst Builders only uses Seamless Gutters because they eliminate seams that may eventually leak. Seamless gutters also allow the water to move more freely though them. We offer Seamless Steel Gutters and Seamless Aluminum Gutters. Both materials work extremely well for creating seamless gutters. We manufacture the gutters right at the job site from a seamless coil. The length of the gutter is measured and the coil is rolled through a gutter machine, which creates the "K-Style" gutter shape. 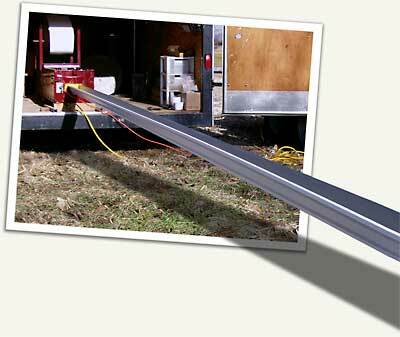 The newly rolled gutter is then cut and installed on your home to perfect seamless lengths. Karst Builders also uses strip miters on all of our corners to show a even cleaner seamless look. Karst Builders also offers Leaf Proof. This is an incredible product that eliminates the need to clean your gutters and allows your gutters to flow properly regardless of the amount of leaves that normally would have built up on your gutters. Leaf Guard can be installed on your existing gutters if the existing gutters are installed and flowing properly. Seamless Gutters and Leaf Proof, especially when used together, are very affordable and reasonable ways to eliminate many possibilities of damage to your home. Please feel free to contact us for a free estimate. Contact us for more information on updating your home with seamless gutters and Leaf Proof.